For the last 2 years I have been thinking about buying a new computer. My vintage September 1995 Gateway (company was called "Gateway 2000" back then), although still useful for most basic computing tasks, continues to be pushed into obsolescence by bigger and more power hungry multimedia type Windows applications. Although I had upgraded my original CPU (Central Processing Unit) from a 100 MHz to 233 MHz and gone from 8 MB to 64 MB of RAM, it just was not enough. My dilemma was that along the way, in fighting off obsolescence, I had acquired a 17 inch monitor, scanner, printer, CD writer, and much software. Therefore, I did not need a computer bundled with these items that most companies want to include in the package. I was looking for a company that would sell me a computer designed with components of my choosing. I wanted name brand quality components and a system that would allow me to upgrade easily. In other words, I did not want any proprietary hardware or a motherboard with integrated sound and/or video which the big name computer makers are fond of using to cut costs. I also wanted an AMD Athlon processor as everything I have read says you get "more bang for your buck" than with a Pentium. That requirement alone knocked Dell out of the running as they only use Intel processors. Dell and Gateway also like to bundle Internet access with their products. I don't need another ISP (Internet Service Provider). I already have an ISP and don't want the hassle of changing e-mail addresses or my Home Page URL (Uniform Resource Locator) which most of the search engines already have indexed. Gateway claims "people rule" but I find that hard to believe with the few choices they offer for configuring a computer. I started my quest for a new computer figuring a 700 MHz CPU speed would be enough but with the passage of time that requirement has moved to 1 GHz. I have the intent (maybe it is more of a dream) of editing home movies on the computer. I already have a Hi-8 camcorder and video capture card which should allow me to get started. In the future I hope to replace the Hi-8 camcorder with Digital 8 and then add a Firewire PCI card. I'm not into computer games so I did not need the fastest frame rate video card with the ultimate in pixel rendering. 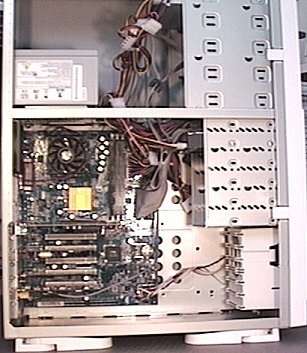 What I wanted was a decent multimedia type computer with a good sound system and DVD (Digital Video Disc) drive. TV-out on the video card was a big requirement. I wanted to be able to record video off the computer back on to a VCR. Along the way I heard about some newer video cards that have dual display heads i.e. you can feed two monitors from the same card and thus save a motherboard expansion slot. Both Windows 98 and Windows ME (Millennium Edition) allow for use of multiple monitors. That became a requirement. AnandTech has an excellent comparison review of Dual Display video cards at http://www.anandtech.com/showdoc.html?i=1423. It took quite a bit of research, something the Internet is great for, to find a company that could fill my needs. For checking and comparing prices on components, which added together would give me a feel for a reasonable system price, I used the search engine Pricewatch (http://www.pricewatch.com). Armed with that basic knowledge I could start to look for companies that would put the package together for me. After much searching I found through PC World (http://www.pcworld.com) magazine's list of "Top 15 Home PCs" a company called ABS Computer Technologies (http://www.buyabs.com) in Whittier, California. They had the configuration options and components I was looking for. And their system price was also very attractive. I was hoping to bring this package in for just under $1000 and ABS allowed me to reach that goal. Questions remaining in buying my new computer dealt with the reputation of the company. Could I trust that I would indeed be getting what I was paying for and that there would be quality service with my order? For answers I turned to two sites on the Internet: ResellerRatings.com (http://www.resellerratings.com) and Bizrate.com's Store Ratings Guide (http://www.bizrate.com/ratings_guide/guide.xpml). ResellerRatings is an excellent site for getting a feel for how happy you will be with your purchase from a mail-order company on the Internet. The ratings and comments are from actual customers. ABS has been in business for over 10 years and the ResellerRatings customer comments did show a few complaints and problems. But the thing that convinced me to go with ABS was that in reading through the comments, I came away with the feeling that ABS always made an honest effort to resolve the situation. And so I ordered my new computer which included assembly, testing, and a 3 year warranty. Here is the detailed listing: InWin Q500 ATX Full Tower case, Gigabyte GA-7ZX-1 VIA KT-133 motherboard, AMD Athlon Thunderbird 1.0GHz CPU, Kingston 128MB 133MHz SDRAM, Maxtor 30GB 7200RPM ATA 100 Hard Drive, A-Open (Pioneer) 16X DVD (40X CD-ROM), ATI Radeon VE 32MB AGP (dual head plus TV-out) video card, Altec Lansing ACS54 (4 speakers plus subwoofer) sound system, SoundBlaster Live! Value sound card, Zoom PCI 56K V.90 modem, Mitsumi floppy drive, ABS scrollmouse, Microsoft Internet Keyboard (has 10 hot keys for the Internet), Realtek PCI 10/100 Base-T network card, Windows ME, and Corel WordPerfect Office 2000 (included free). How happy am I with my purchase? Very happy! Darlene was my ABS Sales Rep and she was just super. The service was excellent. I had several questions which I posed at various times either via phone or by e-mail. By phone Darlene was there immediately. There was no being placed on hold and waiting. Once I called and Darlene was busy with another customer, so I was invited to leave a voice message. Darlene called me back within 5 minutes. Likewise, Darlene answered e-mail questions within a few hours of my asking. When I had technical questions about specific components she gave me the web site address with the answer. She even sent me a JPEG picture of what my full tower case would look like when I asked about the color. I also dealt with Rosemary in Customer Service after the sale and she was just as responsive as Darlene in answering my e-mails. Both ladies are true assets to the company. It really makes a customer feel good to be dealing with a company that cares and does not take days to answer e-mails. I cannot render an opinion on the quality of ABS Technical Support as I have had no need to call them. But if my experience with Sales and Customer Service are any indication, ABS should give the big guys like Dell and Gateway some serious competition. My computer arrived via 3-day FedEx a week earlier than the original estimate of 2 weeks to build and ship. Darlene provided me with the FedEx tracking numbers so I could check it's progress on the Internet. The packing job was top notch and the computer fired up right out of the box with no problems. 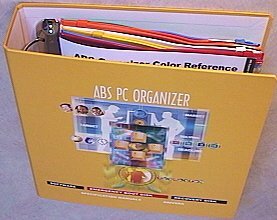 Along with the computer, ABS supplies a large PC Organizer 3-ring binder that has plastic zip lock pages for holding all tech manuals, installation CDs, and application CDs that come with the computer. I must say ABS really has their act together. I also received a large "Quick Setup Guide" chart which showed me how to wire up the pieces. Everything is color coded so it in next to impossible to make a mistake. I could not resist taking a look inside my computer. One of the reasons I ordered it with the full tower case, in addition to wanting plenty of room for expansion, was to make it easy to work on. I was not disappointed. The entire side panel comes off with the removal of just two screws. ABS Computer Technologies did a terrific job in placement of the drives and various cards in the expansion slots. I could not have placed them better. The inside was clean with all cables neatly laid out and bundled. I noted also that ABS took the extra step of tying the Radeon VE Card in with some nylon line. I presume this is to give added strength because of the large heat sink that hangs from the card. My computer came with Windows ME installed along with all the applications for the sound card, video card, and DVD drive. The Corel WordPerfect Office 2000 CD was in the 3-ring binder but not installed, which is great, as I would prefer to install such a huge program myself. Some of the components like the sound card and video card only had CDs. There was no printed manual. But that was no big deal. In the case of some components a PDF (Portable Document Format) file with the manual was on the CD. If not, I could always turn to the Internet and download the PDF versions of the manuals from the manufacturer's web site. Overall I found more bundled software included than I expected. Trial versions of Norton Antivirus/Utilities 2000 SE (Special Edition) were included as well as Paint Shop Pro SE, and earlier versions of Netscape, Communicate! Lite, and eSafe Desktop. The DVD drive came with a program called "Power DVD" on a CD and it was also preinstalled on my hard drive. The ATI Radeon VE video card came with ATI's DVD software player. So I now have a choice of two different software programs for playing DVD movies. Each has some unique features. For example, the Power DVD program allows for capturing video still frames of the DVD you are playing. The DVD playback quality is excellent with a crystal clear picture. One could therefore capture a still frame from a favorite DVD movie and use it as Windows wallpaper. One of the programs I mentioned above was eSafe Desktop (http://www.eSafe.com/esafe/desktop/detailed.asp). This is a comprehensive security program by Aladdin Knowledge Systems that includes both antivirus and firewall protection. It is free for personal use and a fairly complex program. The bundled CD had version 2.1 but I knew a later version was available so I just downloaded version 3.0 from the Internet, installed it and did the auto update for the virus definitions. This is a first class program and it really works. I had alarms going off when Windows ME was quietly (read that "without telling me") trying to connect to the Internet to update itself. eSafe definitely informs you of what is happening. The ATI Radeon VE video card is a new card just released in late February 2001. I chose the Radeon VE because of it's dual display capabilities plus it has the S-video TV-out. A feature of the dual display that intrigued me was the capability of hooking up a Digital Flat Panel (DFP) monitor (via the card's 24-pin DVI-I connector) along with a conventional analog CRT (Cathode-Ray Tube) monitor (via the card's 15-pin VGA connector). Thus, I have a leg up on the future if I decide to buy a Digital Flat Panel display. In the meantime, the Radeon VE comes with a Digital to Analog adapter so I can still hook up two analog (VGA) monitors. It also comes with a S-video to Composite video adapter so I am covered two ways for output to a TV/VCR. Now that I have this multi-monitor display capability I just read where Microsoft may remove this feature from the Home Edition of the new Windows XP (eXPerienced) Operating System and only include it in the Business Edition. Guess I will not be upgrading to Windows XP anytime soon. PC Magazine has a brief review of the Radeon VE called "Double Your Pleasure" at http://www.zdnet.com/products/stories/reviews/0,4161,2706413,00.html. This online review is dated April 11, 2001 and appears in the May 8, 2001 hard copy version of the magazine on page 47. Additional info on the Radeon VE can be found on ZDNet at http://www.zdnet.com/products/stories/overview/0,8826,471039,00.html. AnandTech has a thorough review of the ATI Radeon VE video card at http://www.anandtech.com/showdoc.html?i=1421. Tom's Hardware Guide has an equally thorough review called "Working on Two Fronts: ATI's Radeon VE Handles Two Monitors" at http://www6.tomshardware.com/graphic/01q1/010316/index.html. The article's summary page (http://www6.tomshardware.com/graphic/01q1/010316/atiradeon-11.html) clearly explains why I decided to go with the Radeon VE. The Radeon VE may not be the fastest card around but I think it will serve my purposes well. Finally, as you maybe aware, Creative's SoundBlaster Live! Value card has been around for a while and for good reason. It is one of the most popular sound cards. Aside from it having excellent 4 channel surround sound quality it comes with a bunch of software. Any home musician will not be wanting. Visit Creative's web site at http://www.soundblaster.com/products/sblivevalue/ for a rundown on this card. It really is a great "Value." And ABS Computer Technologies even saw fit to throw in a ABS multimedia microphone to use with my SoundBlaster Live.